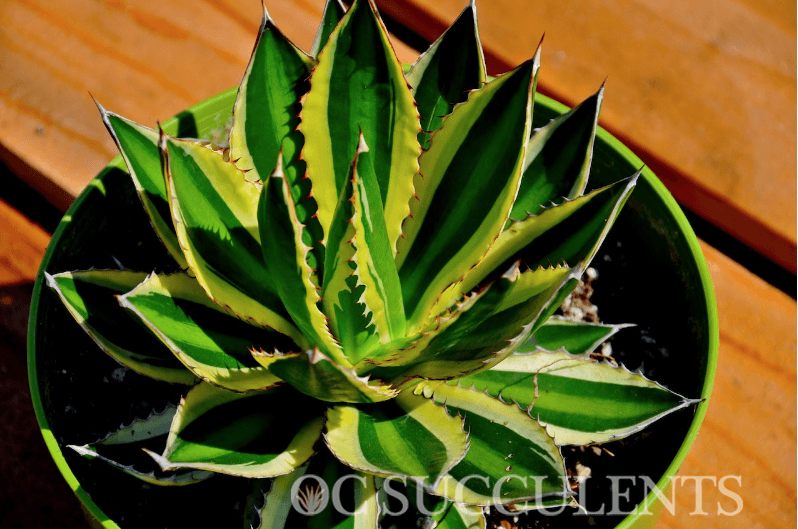 We love the versatility of this agave. Quadricolor has the ability to be paired and contrasted with so many different colors. Each green leaf has an exterior yellow variegation and a lime green center, giving the leaf itself three distinct colors. The green allows it to be paired with many tropical plants as well as aeonium urbicum, or agave attenuata, while the yellow lends itself to the soft comparison of sedum ‘de oro’. The Quadricolor gets its fourth color from its dramatically red teeth where it truly pops against a backdrop of crassula ‘campfire’. The red edging from the teeth can often be lost from regular irrigation, or if the plant is growing in too much shade, but if stressed, and planted in full sun, your Agave Quadricolor can easily have all four colors showing.